Kingdom of Loathing is a browser-based, multiplayer role-playing game designed and operated by Asymmetric Publications, LLC. 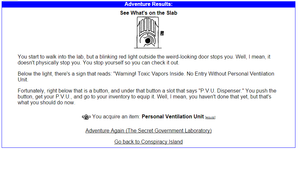 It exists since 02 Nov 2003 and has a long history of weird secret in-game and partially out-of-game puzzles. The Sigil was added on 03 Oct 2014 as a part of the October 2014 item-of-the-month content drop. The game's puzzle has stayed unbeaten from the discovery on 24 Jan 2016 to 26 Jul 2016, when User:DukeBG figured it out. The sigil can be seen in the Conspiracy Island content, by going into The Secret Government Laboratory adventure zone. 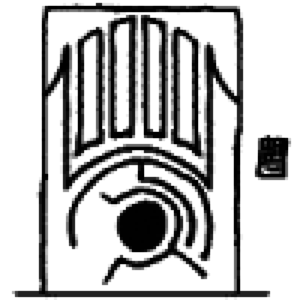 There, as the first adventure of the zone, the player encounters a weird door (image filename weirddoor.gif) in See What's on the Slab. The monsters in the zone have a limitation on the amount of item drops for a player per day (10), so the information about them was intended to be gathered by the community over time. Each monster has a common potion/food drop, a rare equipment drop and a special drop that has to be activated by using A Mysterious Control Panel on the Conspiracy Island. Additionally there is one extra special drop that is activated there and drops from all the four monsters of the zone. Monster Manual drops (added after the 03.10.2014 release): nursery rhyme, grimy lab coat, iron torso box. Bounty-Hunter's drop (added after the 03.10.2014 release): vivisected hair. As it's possible to notice, these drops (excluding the extra ones added later) have different first letters. In fact, their first letters fully form the set of letters from A to M. If you order them alphabetically and extract the last letters from the list, you get nlry9htdotgif. This refers to the puzzle piece nlry9ht.gif on the image server. The puzzle somehow relates to something Jick (main dev) often complains about. A day before the puzzle was solved Discord user TheSparrowHunter contacted Jick by email, clarifying things, including asking if the images were involved in the puzzle and received an answer "no". This page was last edited on 20 August 2016, at 16:35.